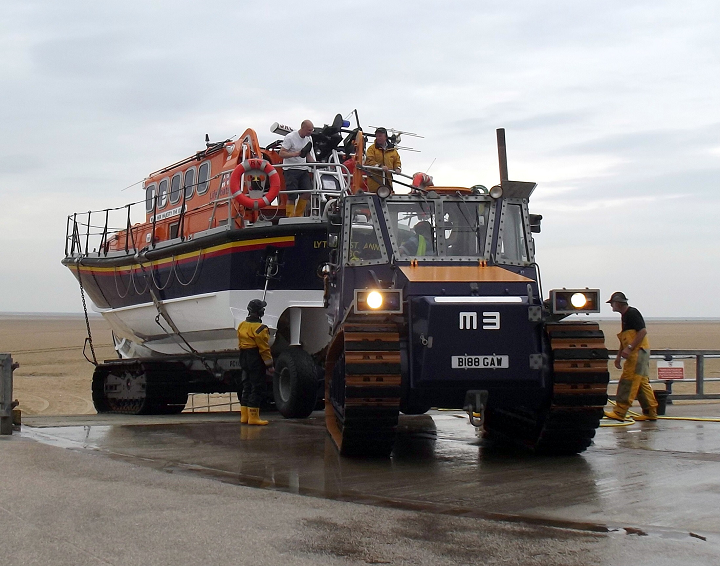 The Lytham St Annes Mersey class All-weather Lifeboat (ALB) Her Majesty the Queen was launched at lunchtime on Thursday 13th August when an 8 metre (28 foot) yacht experienced engine failure off the mouth of the Mersey estuary. The skipper, sailing single-handed from Falmouth to Preston, was becoming exhausted and requested help. The lifeboat was launched at 1.20pm under the command of Coxswain / Mechanic Martin Jaggs and on arriving at the casualty took the vessel in tow after first transferring a lifeboat crewman on board to assist the skipper. The yacht was towed to a safe anchorage off the mouth of the Ribble as her draught was too great to be taken over the Ribble Bar at that state of tide with low water fast approaching. The yachtsman was taken off his yacht and brought ashore in the lifeboat just after 5pm. The Lytham St Annes Inshore Lifeboat (ILB) Sally was launched later that evening under the command of Helmsman Jason Banks to bring the anchored yacht to a safer mooring at Lytham as soon as the height of the tide had increased sufficiently to bring her in over the Ribble Bar. With the weather threatening to deteriorate and the skipper back on board, the yacht was then taken by Helmsman Tom Stuart to a safe berth at the Douglas Boatyard at Hesketh Bank, the ILB being finally recovered at Seafield Road Lytham at 1.15am on Friday (14th).